I foolishly knocked my carriage clock off the mantle while cleaning one day recently and was heartbroken to see its shattered condition on the marble hearth. So I picked up the pieces and took the remains to a local clock shop. The news wasn’t good. My clock was so badly broken that all that could be salvaged was the Seth Thomas brass face. A customer standing in line behind me, carrying his own broken mantle clock witnessed this transaction and commented on how beautiful my bright clock face was. He thought, in fact, it might fit into his own clock, which had a tired, faded face. We held the face up and it seemed to be a perfect size match. He purchased it from me on the spot. While he was waiting for the clerk to research his problem, we struck up a conversation. 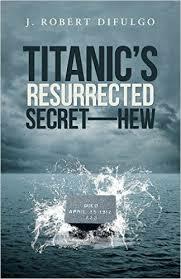 It turns out he’s an author and has just published his second book: Titanic’s Resurrected Secret–HEW.